Dawn over Uluru. 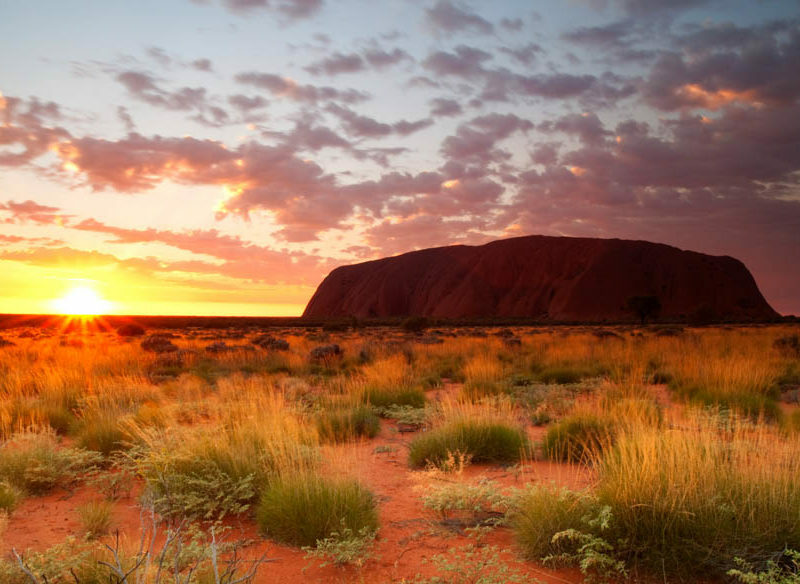 Ayers Rock Campground is the closest place to stay if you're planning a visit. Natural beauty is the Territory’s finest asset, so it makes sense to spend a night or two under the stars. Here’s our pick of the Northern Territory’s best camping for the chance to wake up in the desert, next to thermal pools, or deep in a national park. The secluded Walker Creek campground, near the northern entrance to Litchfield, offers a peaceful alternative to its heavily touristed neighbours Wangi Falls and Florence Falls. This hidden treasure has only eight walk-in sites available. If you have the capacity to lug in what you need (the farthest-flung site is two kilometres from the car park), expect to discover your own private swimming pool, complete with waterfall and running rapids, which flow crystal clear from the sandstone Tabletop Range. Pack a hammock and good book to really settle in and spend the afternoons lazily swinging from the trees, dozing to the tranquil sounds of the creek nearby. Campsite facilities: Picnic table, fire pit and toilet (next to campsite 6). BYO firewood and drinking water. Cost per night: $6.60 per adult, $3.30 per child (5-15 years). Views? Check. Waterfalls? Check. Grassy sites? Check. Gunlom, in the southern region of the World Heritage-listed Kakadu National Park, is certainly a stand-out. Set yourself up in the shady campground and take a short ramble to the bottom of the waterfall for a dip in the main pool. A steep one-kilometre 30-minute hike to the top of the falls rewards sweaty campers with panoramic views of the ancient stone country and forest below, from the refreshing vantage point of an infinity (rock) pool. Campsite facilities: Gas barbecues, solar-powered hot showers, fire pits, on-site campground manager, toilets and picnic tables. BYO drinking water. Cost: $15 per adult, $7.50 per child (5-15 years). Flanked by majestic paperbark trees, twisting pandanus and soft sandy beaches, nothing says ‘tropics’ more than this oasis of thermal pools 200 kilometres south of Darwin. Rest weary bones in the sweet spot where hot spring water meets the cool of the river, and watch bandicoots, quolls and flying foxes while fish nibble at your toes. Campsite facilities: Pit toilet, shower, fire pit, barbecues, picnic tables and drinking water. No power. Cost: $6.60 per adult, $3.30 per child (5-15 years). Piled high in a shallow desert valley, the granite spheres of Karlu Karlu, or the Devils Marbles, 100 kilometres south of Tennant Creek, are a geological phenomenon filled with mystery. Linked to the Dreamtime stories of the Warumungu, Kaytetye and Alyawarre aboriginal people, these clustered boulders are the rounded leftovers of a layer of granite that has gradually eroded over time. Spend the night and you won’t miss a moment of their dazzling transformation at sunset and sunrise, as the changing light casts its warm glow. Campsite facilities: Pit toilet, shade shelter, fire pit. BYO firewood and drinking water. When to go: April to September. Cost: $3.30 per adult, $1.65 per child. If you’re yearning for rocky trails, red dust and campfires, unroll your swag in the rugged, ancient landscape of central Australia. Formed 300 million years ago, and at one point as high as the Himalayas, its West MacDonnell Ranges are teeming with life. Tree frogs, dingoes, birds and wallabies call the region home, and there are spectacular waterholes, too, with the intimate Redbank Ridgetop camping ground at Redbank Gorge one of the more scenic spots to pitch a tent. Close to the cathedral-like gorge and offering basic facilities, this is the ideal base camp for adventurers looking to spend a day exploring or hiking a section of the world-famous Larapinta Trail. Campsite facilities include: Toilet, fire pit and picnic table. With its remote desert location, deep cultural significance and spectacular natural beauty, Uluru-Kata Tjuta National Park is one of Australia’s most unforgettable attractions. Because of the site’s significance to the local Pitjantjatjara and Yankunytjatjara people, the nearest place to stay is 15 kilometres away in Yulara, at the Ayers Rock Campground, which has grassy sites and a pool. With the area’s myriad walking tracks, rockpools and art sites, it’s worth allowing a couple of days to explore and observe the changing moods of the Rock. Campsite facilities include: Communal kitchen, shared gas barbecue, laundry, wireless internet, swimming pool, volleyball court, playground, pet-friendly. Cost: From $40 unpowered site, from $49 powered.